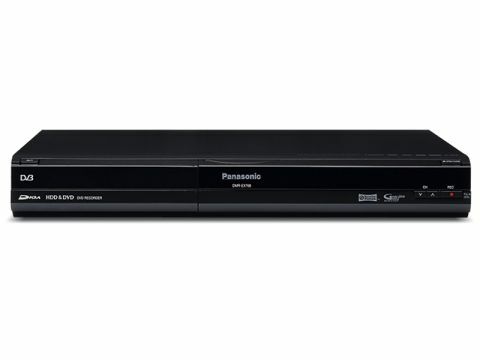 It may be Panasonic's entry-level DVD/HDD recorder, but the smart-looking DMR-EX768 delivers all of the essentials. Unless you're living in an area without usable Freeview coverage, that is; this budget marvel, like the rest of Panasonic's digital-ready range, lacks an analogue tuner. Provision has been made for external RGB Scart sources like digital cable and Sky, but while the EX768 takes advantage of the increasingly-familiar GuidePlus EPG, external IR control of set-top boxes is unsupported. Also missing are the USB ports, i.Link port, SD card slots, CD-ripping music jukebox and DivX compatibility of the more expensive Panasonics. However, everything you'll need for day-to-day DVD playback and TV timeshifting is here – 720p/1080i/1080p upscaling via HDMI; multi-format DVD recording; 32-event timer and 160GB of HDD capacity. That HDD endows the EX768 with the PVR-like potential of Freeview Playback, key to which is the ability to pause 'live' TV. Unfortunately, there's a distracting graphic onscreen whenever the mode is engaged, coupled with an inability to permanently save recordings currently residing in the buffer. You do, however, get SeriesLink and compensation for delayed starts and split-programmes. Not so long ago, you wouldn't have found this stuff on any DVD recorder regardless of price. Setup is easy. The menus cover pretty much every parameter you'll need, including HDMI mode, analogue AV configuration, DVD playback preferences and recording settings. Key among the latter is the ability to switch the bottom EP mode between six and eight hours per disc, or – at the other end of the quality scale – choose standard Dolby Digital or PCM mixes for the top XP mode. Use Dual-layer recording to cram around two hours of XP video onto a single disc. If you want to edit HDD content, the EX768 comes into its own with its powerful yet user-friendly trimming and divide tools. When dubbing to DVD, a 'flexible-recording' mode automatically juggles around with bitrates so that a user-defined list of HDD recordings can be crammed onto a single disc. Freeview pictures are clean but a bit soft, certainly when compared to the very best PVRs. Recordings from Freeview and an external Sky box are excellent by the standards of consumer recorders, especially in the top two modes; the full-resolution LP mode is highly-detailed, especially if the source material is fairly static, but movement is spoilt by obvious blocking. I'm impressed with the EX768's upscaled DVD playback, too – pictures offer superb dynamic range, detail and colour fidelity.